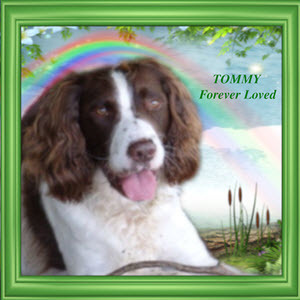 Too many furrends…we read that Cyndi at the Funny Farmer’s has gone over the bridge. Mom is furry sad. 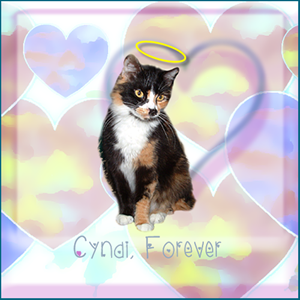 Cyndi was a beautiful cat! And I believe, even though Percy thought he was the Spokescat, Queen Penelope told me it was really Cyndi. As a matter of fact, I can see Queen Penelope and Cyndi drinking Meowgaritas and having a good chin wag right now, looking down and discussing our merits. Today is Monday and Mondays we go to Comedy Plus for Awww Mondays! Since Mom has today, Monday off, she stayed up a little later than usual. Here are me and Ninja waiting for her to come to bed. And here is a great closeup of ME!!! Yes Mom, the claw work on the curtains NEW and it is mine…I did it this afternoon. Now get those treats and come to bed!